According to the Japanese PlayStation Store, the file size for Metal Gear Solid 5: The Phantom Pain will only be 25.1 GB. If there's been one common thing many of the current generation's games have shared, it's been a propensity for open worlds. Grand Theft Auto V, The Witcher 3, Batman: Arkham Knight; they've all presented players with big play spaces rife with story, side content and extras. An unfortunate side effect of that hugeness however, is that those games also come with hefty install files which, in some cases, have climb as high as 50GB. With Metal Gear Solid 5: The Phantom Pain focusing on open world mechanics, many likely assumed it would be a similar story. That being the case, it's recently been revealed that the game might not be the data hungry monster many were expecting . According to a digital listing from the Japanese PlayStation Store, a full download of The Phantom Pain will only require 25.1 GB of hard drive space. That's still substantial, of course, but it also strikes as a bit odd when you compare it to previous games in the series as well as prior statements from The Phantom Pain's creators. The more linear Metal Gear Solid 4 on the PS3, for instance, requires 26.6 GB of space; more than the sequel. 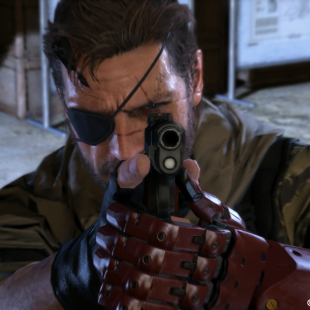 The Phantom Pain's file size is also surprising when you consider that Hideo Kojima had previously stated that it would be "hundreds of times larger" than its length-challenged predecessor MGS 5: Ground Zeroes. Ground Zeroes clocked in at 3.6 GB. There could be a number of good reasons for The Phantom Pain to be smaller on the file size front. The developer's drive to go open world, for instance, could mean that it will have fewer space hogging cutscenes than Metal Gear Solid 4. If the game reuses environments like Ground Zeroes did for side missions, it's also conceivable that its length could have been beefed up without requiring much more data. It could just be that Konami's really good at compressing data. We can't be sure of the reason. That said, we'll let you know when we learn more.